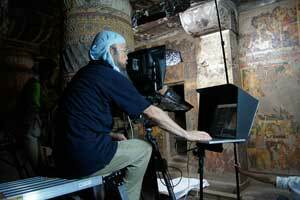 The National Research Institute for Cultural Properties, Tokyo and the Archaeological Survey of India (ASI) conduct joint research on the conservation of the wall paintings of the Ajanta Caves, under the framework of the Exchange Program of International Cooperation of Cultural Heritage commissioned by the Agency for Cultural Affairs and the government subsidized budget for the Cooperative Project for the Conservation of Cultural Heritage in West Asia. We aim to share knowledge on conservation and exchange conservation techniques that are necessary for this project. 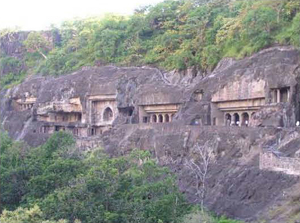 The wall paintings of the Ajanta Caves have many problems – the leaking of water from cracks in the base rocks, biological damage, artificial damage, and discoloration caused by past treatments and the deterioration of colored layers. Noticeable things among these problems are the blackened and whitened bat excrement and the yellowed and darkened varnish (shellac, PVAC) coated on the surfaces of wall paintings. 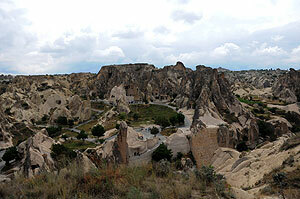 We have currently not yet discovered any effective methods that would lead to assured conservation. 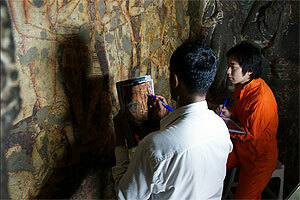 To overcome these problems, we conducted cleaning treat of the wall paintings of Cave 2 during this fifth mission (from November 14th to December 4th, 2010). Utilizing the scientific analyses and documented data accumulated up until last year, we examined appropriate conservation methods together with the Indian conservation specialists. 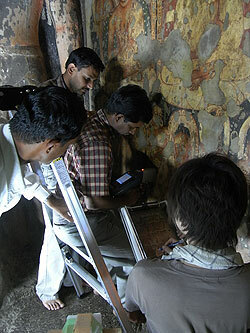 From February 12 to March 15, 2009, the National Research Institute for Cultural Properties, Tokyo, dispatched the first mission for the “Networking Core Project Concerning the Conservation of Mural Paintings between the National Research Institute for Cultural Properties, Tokyo, and Archaeological Survey of India,” a part of the Networking Core Centres for International Cooperation on Conservation of Cultural Heritage. 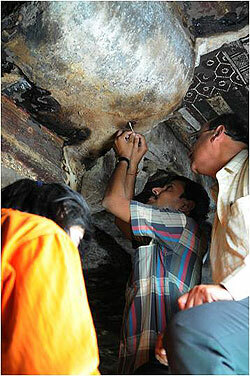 There are many valuable Buddhist mural paintings remaining at Ajanta Caves dating up to the first century C.E. 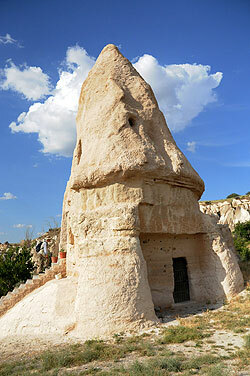 in the earlier period and to the fifth to approximately the eighth centuries C.E. in the later period. 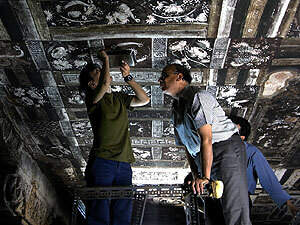 However, when trying to conserve these paintings, various problems that are found with the mural paintings of Bamiyan are shared at Ajanta: the strength of the bedrock where the caves were cut, the infiltration of rainwater, bat excrement and blackened attachments likely caused by smoke. To deal with these problems, the first mission conducted investigation together with Indian conservation experts and shared knowledge and experience of conservation materials and techniques, aiming to develop human resources and transfer technology. 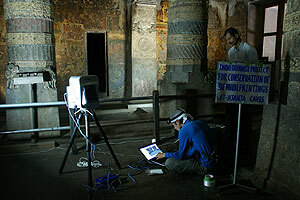 Specific details of the investigation included the following: recording the condition of conservation of the mural paintings (photographing, rough measurement of caves and condition survey), installing thermohygrometers (data logger) to survey the environment; studying the chronology, techniques, and materials of the mural paintings (sampling specimens, infrared/ultraviolet photography and nondestructive analysis using a portable X-ray fluorescence spectrometer); and examining bat excrement. 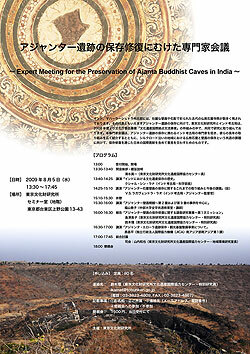 On November 21, 2008, the National Research Institute for Cultural Properties, Tokyo and the Archaeological Survey of India (ASI) concluded an agreement on a research project for the conservation of the mural paintings at Ajanta Caves. There are many valuable Buddhist mural paintings at Ajanta Caves dating to both the earlier period (1st century BC to 2nd century AD) and the later period (5th century to 6th century AD). However, these mural paintings have deteriorated severely due to structural problems of the bedrock itself, damage from floods in rainy seasons, bat excrement, and blackened markings likely caused by smoke. 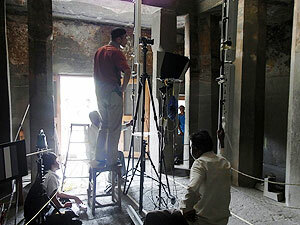 To deal with these problems, the National Research Institute for Cultural Properties, Tokyo will survey Caves no. 2 and no. 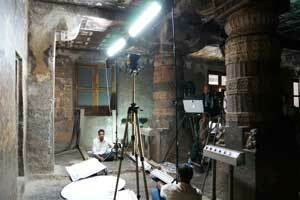 9 of Ajanta from 2008 to 2010 as part of an exchange program commissioned by the Agency for Cultural Affairs. 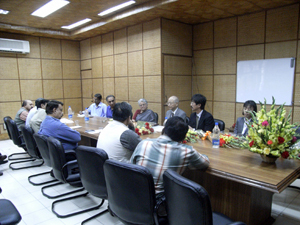 Indian and Japanese specialists will exchange and share knowledge of conservation techniques and materials, expertise, and experience, aiming at improving the techniques and abilities of both groups of experts.